Prince Tuesday is the son of King Friday XIII and Queen Sara. He is also the older brother of Prince Wednesday and cousin to Chrissie. He works at the Neighborhood grocery store, as a waiter at the Neighborhood restaurant and, when needed, he provides babysitting services for Daniel Tiger. He also cares for the horses at the Neighborhood farm. 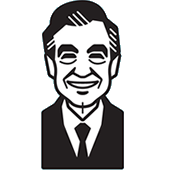 Prince Tuesday was a mainstay in the original Neighborhood of Make-Believe on Mister Rogers' Neighborhood.